Stumbling through the language barriers in China has been a little more challenging than most of the countries we’ve been to on this adventure. Fewer people speak English or have English menus. Which hasn’t been too much of a problem. 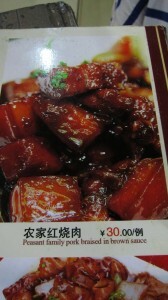 But it has been surprising to us that few places in China have picture menus compared to all the other countries we’ve been to. I fear we’ve become semi-dependent on them and I’ve come to wonder how I will order in restaurants at home if everything is not presented in picture form. Challenges, challenges. 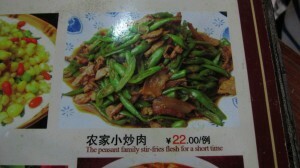 "The peasant family stir-fries flesh for a short time." 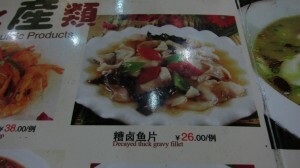 At a delicious hole-in-the-wall find in Shanghai we were lucky to find and excellent pictorial menu that even had the following English translation which entertained us during our meal of peasant flesh and decayed fish. Mmm. 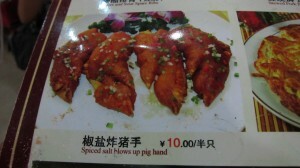 "Spiced salt blows up pig hand." 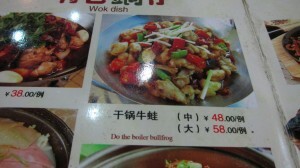 We were highly amusing to the restaurant staff when we asked for the menu back and proceeded to take these pictures. 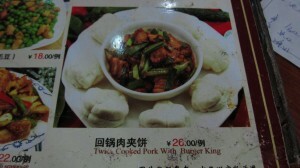 "Twice cooked pork with burger king"
"Peasant family pork braised in brown sauce."